Avebury is a picturesque and unique village in Wiltshire located within a massive stone circle. A favourite place for tourists and also for pagans and druids. The village of Avebury in Wiltshire with its ancient stone circle is one of my favourite places in the UK. It is really worth travelling to if you have never been there and well worth returning to if you have. Many druids, wiccans and other pagans do to celebrate the seasonal calendar and its eight festivals with the Summer Solstice being the biggest gathering of all. Avebury stone circle is believed to be the oldest of its kind in existence and it is also the largest stone circle in all of Europe. As a village, Avebury is contained within a stone circle which makes it very unique. The Modern Antiquarian includes a complete guide to over 300 prehistoric sites, in a relentlessly thorough gazetteer which divides Britain into seven color-coded sections. Avebury is located between the English country towns of Calne and Marlborough but can also be reached by coming down from Swindon through Wroughton. A bus service operates on this route, which is the A4361 from Swindon to Devizes, but you really need to get the timetable or you could end up stuck and it is a very long walk, as I can testify to having once done. I used to get a train from Cardiff to Swindon and then travel by bus the rest of the way, making a return journey in reverse early evening. Avebury is most famous, and rightly so, for its stone circles, for there are actually more than one in the whole area, and many of these stones are huge and are encrusted with lichens. There are also avenues of standing stones, barrows and a gigantic earthwork that runs around the site with a massive ditch. Some of the original stones are missing today and it is believed that they were used as building material in past times. This doesn't detract from the magical feel of Avebury today though. There really is nowhere else quite like it. Many people enjoy walking around in the areas the stones are in and there is a pathway up on the earthwork too. It is a wonderful place to marvel at the work that went into creating all this and to ponder on the mysteries of the past. Like Stonehenge, there are many theories about how and when Avebury was built although it is generally accepted to be some 5,000 years-old. Sometimes parts of the site have to be closed to walkers to prevent erosion but there is always more than enough that is open to the public. Avebury is a Scheduled Ancient Monument, a World Heritage Site, and is managed today by the National Trust. The Alexander Keiller Museum, which is housed in the village of Avebury, has various prehistoric artefacts on display that were collected by archaeologist and businessman Alexander Keiller, and many of these had been discovered at Avebury. A 17th century threshing barn contains a permanent exhibit gallery about Avebury and its history and is well worth taking a look around. There is a National Trust shop here too selling souvenirs and information books. 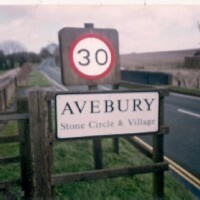 Avebury has its own church that is easily found down the main street that runs through the village. The St James Church stands in a quiet traditional churchyard. Avebury also has a Tudor manor house and this building is open in part to the public most afternoons so that people can look around it and its spacious gardens. There is a large gift shop known as the Avebury Henge Shop that sells local history books as well as ones about New Age subjects, astrology, herbalism and so forth, and obviously caters for the large number of pagans and people who are interested in the mystical side of life that flock to Avebury. There is always a good selection of Avebury postcards available so you can send to your friends and family and show them where you have been. A real focal point and a place where many a visitor to Avebury relaxes over a meal and a drink is the Red Lion pub. You can't miss it with table and chairs outside and a large car-park. On pagan festival days and nights the Red Lion is always packed with customers all bedecked in robes, capes and mystical jewellery. The druids will be obvious with their white or coloured robes and druidic staffs. The Red Lion is also said to be haunted and various investigations have been made into researching the ghosts and spirits that have been reported there. As an ordained Bard of the Free Gorsedd of Bards of Caer Abiri and as a Quest Knight of the Loyal Arthurian Warband druid order I have spent many days and nights in Avebury at the times of the eight seasonal festivities. These are always joyous occasions in which pagans of various pathways gather together in Avebury for celebrations in the open air. Often tourists and people of other faiths feel inspired to get involved too if only as spectators. Gorsedd celebrations are held in the Avebury stone circle over the road from the Red Lion and a large circle of participants can be formed. These events feature poetry and song with acoustic music by bards as well as hand-fastings (pagan marriages), blessings and announcements of interest to people gathered together there. Several druid orders always take part. Because the actual date for a specific festival on the pagan calendar can fall midweek for the benefit of working people the celebrations are always held on the weekend nearest to the day. Saturdays being the main day and it is usual for people to assemble around noon, although many get there a lot earlier than that. For most of the year the numbers are within a reasonable figure but at Summer Solstice the tiny village gets jam-packed and the car-parks both fill up fast. Besides the Red Lion pub's car-park there is a large one run by the National Trust for which you are expected to pay a fee to use it. There have been problems with the local authorities due to people camping where it is not permitted and for causing parking problems but on the whole Avebury has been free of the tension and trouble that has so often erupted at Stonehenge. Personally it is because it is much easier to attend a celebration at Avebury than one at Stonehenge that I prefer the site. Avebury often has had crop circles in the farmland fields that surround it. These mysterious phenomena whether made by humans, aliens or some unknown forces, fit in well with the mystical nature of Wiltshire and its downlands. Just outside Avebury and well within walking distance is Silbury Hill as well as the West Kennet Long Barrow. These sites are very popular with visitors to the area and with people who are fascinated by the past. Silbury Hill is the largest mound made by humans in Europe and is mainly made up of chalk. Its original purpose is still uncertain. Rock star turned author Julian Cope points out in his study of the ancient sites of Britain, The Modern Antiquarian, which was published as a book and made into a TV series as well, that Silbury Hill would have been the focal point and the hub of the landscape that would have been seen by the ancient people who had travelled to the area and would gather in Avebury. He points out that it would have been white in those days from the chalk it is made of. I once climbed up it with a friend on a summer's night and having read the information board that stated that no ones knows why Silbury Hill was created I said:"It's obvious it was built so people could get an even better view of the heavens." The views of the Milky Way and all the constellations on a clear night are truly out of this world. The Red Lion Inn at Avebury, home to dark forces since 4000 BC, is the place of a famous ghost named Florrie. She was killed by her husband together with her lover, and the bodies were thrown down a well. Avebury and its pre-historic past - a detailed description of the neolithic monuments and their colourful history. West Kennet Long Barrow is one of the many prehistoric monuments that are part of the Avebury complex of Neolithic sites. It is one of the most impressive and well-preserved burial chambers in Britain, as well as being one of the most visited. Thank you for sharing that, Jo! I will copy and send your comment to Arthur now! I do love Avebury! When I was a little high priestess, I was asked to do a handfasting there. I'd done them before, but nothing on this scale. I'm not great at public speaking and there were going to be so many people there! We went for rehearsals and everything. On the morning of the handfasting, I awoke earlier with eyes wide open. Within minutes I was in the bathroom being very, very nervous. My friend heard me throwing up and came to investigate. She got me into the circle on time. She kept saying things like, "Ok, you don't have to do the hand-fasting, but just have a wash... just get into your robes... just recite the words for me... just go outside... just get into my car..." etc until I was in the circle, with an athame in my hand and the bride and groom grinning at me. What could I do then? I was representing the Lady. Needless to say it all turned out fine. I've been back many times, in calmer conditions, and I'd recommend a visit to anyone.